When spouses have high incomes and must then value and allocate complex assets in divorce, there are more opportunities for disagreement than in an average family law case. These disagreements, if not guided by experienced legal counsel, can quickly lead to contested divorce litigation. A high asset divorce lawyer can reduce conflict, negotiate fair settlements and be ready and able to litigate issues in court. This is especially needed when a spouse has high net worth, high income, complex property and/or a business in divorce. 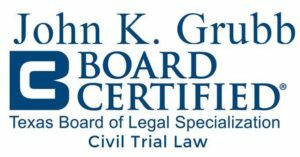 Attorney John K. Grubb is board certified in Civil Trial Law by the Texas Board of Legal Specialization. He also has an MBA in Accounting and Finance from the University of Texas. High income divorces frequently require coordination with the party’s financial planners and Certified Public Accountants. Sometimes the income is generated from a single source while other times it comes from a number of diverse sources. Sometimes much of the parties’ wealth includes tax sheltered investments, real estate, family limited partnerships or closely held corporations. Significant tax loss carry forwards exist in some situations. In other situations, it is necessary to structure unique and complex arrangements to avoid triggering a taxable event. The restructuring of marital assets to facilitate a division in the divorce may then trigger tax consequences. High net worth divorces almost always require coordination with the party’s financial planner, Certified Public Accountants as well as, in many cases, trust officers, foreign attorneys, and bankers. You must also account for many other types of property in divorce. For example patents and trademarks, licensing agreements, oil and gas interest, royalties, annuity contracts, real estate investment trusts, investments in limited partnerships, accounts receivables, assets owned outside of the United States, trusts, farm and ranch lands, boats, planes, tax sheltered investments, tax loss carry forwards, animals, etc., must all be addressed and valued in a divorce. Looking for a High Net Worth Divorce Attorney in Houston TX? John K. Grubb has been representing high asset spouses and high income parents to negotiate fair divorce settlement agreements for over 30 years. If we cannot reach a settlement, then he is ready and able to take the case to court for a divorce trial. To schedule a consultation, call our office or submit our online high asset divorce attorney case review form.